The EIGR family of IP routers are perfect for automation systems and job sites that require remote access. However, the Internet can be a scary place and you don't want to be tracked, identified, monitored, or even hacked. IP router features like Port Forwarding and NAT can be used for accessing devices remotely, but it is usually a frowned upon practice. A Virtual Private Network (VPN) connection provides privacy and security for your network traffic. VPN providers exist and offer VPN services with various plans and fees. However, for network-savvy customers wishing to avoid subscription fees the newly released EIGR routers can be configured to operate in OpenVPN server mode. OpenVPN is an open source software application that implements VPN techniques across a wide variety of devices, including computers, tablets and smartphones. EIGR-V routers can be configured to operate in OpenVPN server mode, thereby eliminating the cloud service and related fees. Setting up an OpenVPN server on your own is not trivial, as it involves setting up a root certificate authority and generating certificates and keys for the server and each client device. However, the EIGR-V's built-in webpages facilitate the tasks without requiring downloaded software to generate certificates or keys. 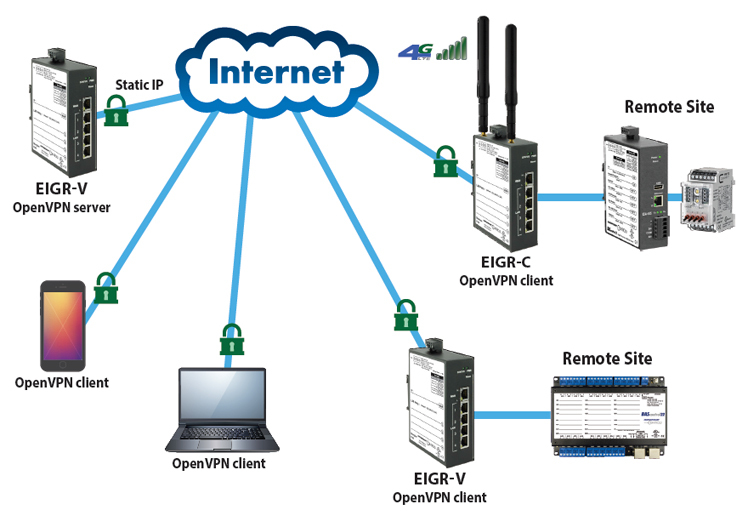 One EIGR-V set to OpenVPN server mode and assigned a fixed public IP address resides at the client site or any convenient site and uses the Internet for communicating to OpenVPN clients without any cloud service involved. The EIGR-V in the server mode can support up to 15 EIPR-V/EIGR-V routers in the client mode. Up to 15 PC clients (any device with OpenVPN functionality) can be connected to the OpenVPN server. This setup can provide secure remote access to the IP devices on the LAN side of the EIPR-V / EIGR-V OpenVPN client routers. Each device can be accessed with a specific IP address and there is no additional requirement to set up Network Address Translation (NAT) or Port Forwarding on the client routers. Furthermore, the OpenVPN clients only require internet access- there is no requirement for a static public IP address. Dynamically assigned IP addresses are fine. The only requirement for a public IP is for the EIGR-V that is hosting the OpenVPN Server. The OpenVPN server router itself can be connected behind an existing firewall/router with a public IP and have the OpenVPN port forwarded to it. "The EIGR-V is an ideal setup for troubleshooting and diagnostics for remote access at multiple locations," says Harpartap Parmar, Senior Product Manager.